The well-known company focusing on consumer, business-to-business, and industrial imaging solutions, Canon has announced its newest 12.2-megapixel EOS Rebel XSi DSLR (digital single lens reflex) camera (also named as Canon EOS 450D in other area), utilizing Canon’s EOS Integrated Cleaning system which had first introduced on the EOS Rebel XTi camera. Outstanding Image Quality: New Canon 12.2-megapixel CMOS (complementary metal oxide semiconductor) sensor, DIGIC III Image Processor, 14-bit conversion for smooth tone, gradations, extensive noise reduction technology, and new Auto Optimization for superior highlight-shadow control. Fastest Rebel model to date, excellent performance with 3.5 fps continuous shooting, up to 53 full-resolution JPEGs or 6 RAW images in a burst, and reduced shutter lag time. Large 3.0-inch LCD monitor, with 170° wide viewing angle, superior viewing in daylight, and Live View Function. Fast 9-point AF system, and two types of AF during Live View Function. New advanced features include spot metering, external flash settings on the camera’s menu, and a new higher-magnification viewfinder. “This new EOS Rebel XSi camera is the answer for those who have been waiting to make the leap from digital point-and-shoot to digital SLR or from an older SLR to the latest generation of advanced technology, while still including the creative controls their old camera afforded them,” said Yuichi Ishizuka, senior vice president and general manager, Consumer Imaging Group, Canon U.S.A. 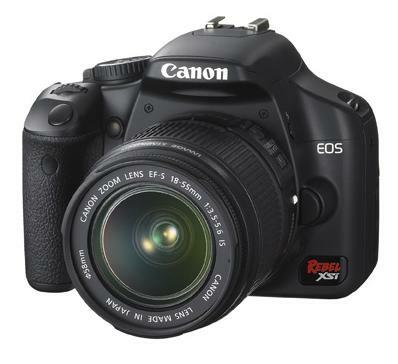 The new Canon Rebel XSi DSLR will be available in coming April 2008 for $800 in a body-only pack, or $900 with an EF-S 18-55mm 3.5-5.6 IS lens.